TORONTO, ON – Bellwoods Brewery has announced the release of two new beers – one a spin-off of one of the brewery’s core brands, and the other the latest in a series of limited edition barrel-aged blends. In life, Jutsu is all about stealthy ninja techniques, but in beer it’s a fantastically balanced pale ale. Easy drinking with low bitterness. And if Jutsu is the talented sidekick, Double Jutsu is the dazzling superhero. Early in 2016 we devised a plan to take our fan favourite pale ale, and bump up the alcohol and dry hop. What has emerged is a refreshing, balanced, but juicy IPA that provides a more intense hop experience. Barn Owl No. 3 is a blend of saisons aged in old use oak barrels, with our house blend of Brettanomyces strains, other bugs, and fresh Niagara peaches (that yes, we de-pitted all by hand…). Beautiful brett derived notes of honey alongside soft floral aromatics. A pleasing acidity on the palate characterized by flavours of citrus and peach, in a dry, effervescent body. Blend No.3 is a harmonious blend of brett, tartness, and fruit, that’s perfect for both special and un-special occasions. 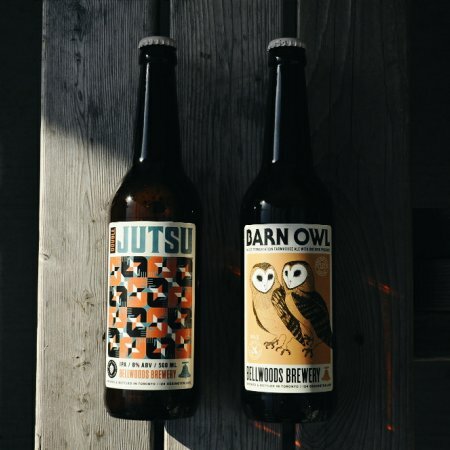 Both new beers went on sale at 11:00 AM today in the Bellwoods retail store, with Double Jutsu selling for $6.50 per 500 ml bottle, and Barn Owl No. 3 – which is limited to approximately 4800 bottles – for $12 per 500 ml bottle.